Building and maintaining a good credit score can be a daunting task. One of the best ways you can improve your credit scores is to get a personal loan. You may think that going further into debt is not a good way to boost your credit. This is true, but if you use the loan to restructure your debt, it can help your standing with the three major credit bureaus a good deal. There are two types of credit. Revolving credit lines such as credit cards and installment credit lines like personal loans or car loans. Mortgages are also another form of installment credit lines. One of the best ways to improve your score is to have a healthy mixture of both on your credit report. They key thing to remember is to have both, but do not go overboard and get every type of credit you possibly can. Too many accounts on your credit report can be as bad as not having enough. Another advantage to personal loans is that you are required to make a fixed monthly payment. Many people get behind on their bills and just make minimum credit card payments; in the meantime, they end up paying a fortune in interest. With a personal loan, you pay a pre-determined monthly payment that includes the interest plus part of the principle. It is also possible in many cases to use a lower-interest personal loan to pay off high-interest debt like credit cards. The process of getting a personal loan is different for everybody. Some people go the credit unions, others go through banks, and many go through online sites. In all cases, your credit rating will determine your choice of available lenders. As a rule, the higher your credit score is, the better the interest rates will be on your loan. However, even if your credit score is not so good, a high-interest loan is still worth considering for reasons that will be discussed later. One thing that can help you get a better interest rate is if you have some sort of collateral, you can borrow against like your 401k plans. If you can find a co-signer, that can help too. Banks look very favorably upon co-signers because they know that if for some reason you fail to repay the loan, the co-signer is also legally responsible for paying off the debt. Be patient and spend some time searching all your available alternatives. Do not just accept the first offer you receive. Additionally, do as much research as you can before you apply for the loan so that you do not run up too many inquiries on your credit report because many inquiries coming in over a short period will actually hurt your score. Your first temptation may be to take your newly acquired funds may be to spend the money. This is the worst thing you can do because defeats the biggest benefit of getting a personal loan in the first place. The smart way to spend your money is to pay off some of your credit cards. The best way to cope with your debt is to use the loan money to consolidate it. As mentioned earlier, even if the initial interest rate you receive on your loan is high, it will still likely be lower than the interest rate on your credit cards. Additionally, after you make six months to a year’s worth of payments on time, you may be able to refinance your loan and get a lower interest rate. Pay off and reduce as many of your credit card balances as possible. However, do not cancel the credit cards once you pay them off. Another reason using a personal loan for debt consolidation is such a good idea is that it improves your available credit to debt ratio. Credit bureaus and lenders look most favorably upon people who have a good amount of available credit, but do not have high balances on their accounts. Personal loans are harder to get than credit cards, but that is also part of why they look so favorable on your credit report. You build credit-worthiness by building trust. If a company trusts you enough to give you a personal loan, then it is a good reflection of your ability to pay back your debts. With a good credit score, your financial future will definitely look brighter. Prosper and Lending club can be a good way to get a personal loan with less interest rate than what you may get outside. Interesting…I assumed those would be higher interest and more geared towards people who can’t get a bank loan. Personal loans can be a good way to fix your credit, but you have to be diligent in paying them on time each and every month. If you are not good with your money, then you will end up just messing up your credit more. I know someone who consolidated their credit card debt this way. It seems like a good plan to me. On your credit history it would look like you paid off those cards and were approved for another line of credit. To ultimately get out of debt though you do need to be diligent with your payments and find ways to put extra towards that debt. Loans are a good way to improve your credit but another way to do it is to increase the amount of credit you have. For example, if you have a credit card with a $1000 credit limit and you increase it to a $5000 limit. However their are other factors that play into this as well such as the amount of debt you carry versus the total amount of credit that is available. If you have $10,000 worth of credit but have $9000 of debt you really only have a $1000 of available credit and that could affect you negatively as well. I think I’m pretty good with that strategy, but not really on purpose. They’ve just offered me credit limit increases over the years and I just accepted them. I’ll never use anywhere near the limit, but I like knowing that I have an abundance of credit available to me. It seems to have helped me get a good mortgage pre-approval rate too. 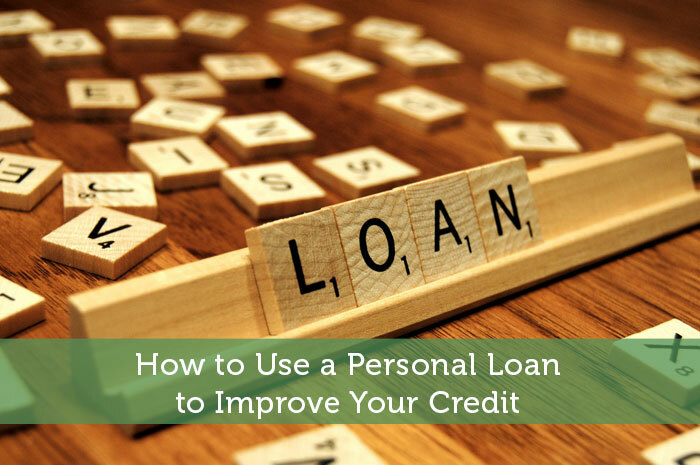 I respectfully disagree with the premise of using a personal loan to build credit. I believe a secured credit card is better, since you can avoid paying interest on a credit card and secured credit cards generally have low limits. If the card has low limits, how practical could it be when someone is trying to pay down debt? Usually the amount of debt is too high to fit on a credit card that they’d get approved for at that point. A personal loan on the other hand can be attained with an agreement to cancel the credit card where the balance currently is. It’s great knowing that with a loan at least the debt is being paid back within a specified time period. Depending on the term the monthly payment might cost more than the combined minimum payments on your cards but at least the debt is being repaid! Sometimes a higher monthly payment is the extra pressure people need to get their debt paid off quicker. So I think it’s a pretty fair trade off, but obviously the person should be in a position to be able to afford that payment increase. I’m with Nick on this one. I too disagree 100% with this premise and here’s why: The biggest disadvantage of this strategy is that it does not teach the consumer new habits! In fact, it probably will enable them to continue what is already bad spending habits to begin with. And if this is the case and they don’t stop using the cards after they pay them off, they will get back into debt and their credit will still take a hit anyway. For my money, this is a case of curing the symptom, not the disease! It is only part of the solution. The person I know who did this had an agreement with their bank that they would close that credit card as soon as the loan went through. So at least it took away that temptation. They do need to learn to better manage their money, but it doesn’t make this a bad move. They’d still ultimately pay lower interest and get the debt paid off quicker. With your analogy, I’m sure those people would want to cure their symptoms in the meantime while working long term to cure the disease. No point in putting up with the symptoms in the meantime. If you go this route and get a loan to pay down some credit cards, do yourself a favor. Put the credit cards away (don’t canel them since that would hurt your credit score). But put them away. If you have enough discipline not to use them then I commend you. But I can tell you from personal experience that for a person that is used to debt, an “empty” credit card is a temptation to buy things you “Want” but don’t really “need”! Yep a lot of people in debt do have that problem. Hopefully if they are going this route they have finally accepted their problem and have vowed to be better with their spending. The worst thing that could happen would be getting into further debt with the cleared off credit cards. Nice strategy I should say. But I only want to acquire personal loan when really needed. I would say getting of debt quicker is a pretty dire need. Loans are often looked down upon, but those kinds of items on your credit history look very good to future creditors. Taking out a personal loan to settle debt is a wise decision. This should be done responsibly and payments should be made as required, otherwise you may be worse off than you were. Yes it makes a lot of sense if you can get a lower interest rate on the loan. It’s worth looking into if you have high interest debt that you are struggling to pay off. Nice article on personal loan, we need to have a good credit score so that banks can believe in you to give a loan and payback at time, thanks for this useful article.